Try PowerMD+ Electronic Medical Records (EMR) free with no obligations to purchase or subscribe for 30 days! Register for free and start today! 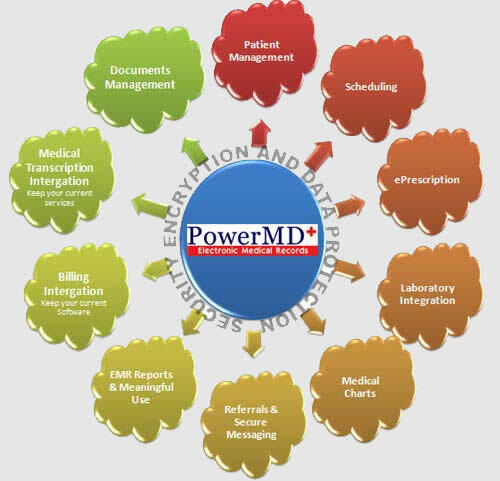 PowerMD+'s Electronic Medical Record (EMR) is a web based software-as-a-service (SaaS) solution integrating Practice Management, Patient Management, and Patient Portal for small & medium sized medical practices. Power MD+ software provides cost effective, complete, customized solutions conforming to ARRA Act, HIPAA standards, and HITECH requirements; as mandated by the U.S. Department of Health and Human Services. Eligible Providers (EPs) using PowerMD+ Software can demonstrate Meaningful Use and qualify for government incentives. PowerMD+ customizes each practice's need based on their specialty and requirements, as no two medical practices are same. Electronic Medical Record (EMR) software includes each specialty related medical charts, templates, ICD/CPT codes, patient education, and interface; at no additional cost! PowerMD+ helps the physician through the process and complexities of converting their practices into an efficient, cost effective, paperless office enabling them to see more patients. 100% uptime Most affordable solution in the market! PowerMD+ helps create an efficient, paperless office!